Visual Paradigm supports reverse engineering ERD from .ddl and .sql. It forms nice Entity Relationship Diagram out of the create and alter statements written in DDL (Data Definition Language). With an ERD, you can produce a data dictionary, or to revise the design and generate a database, etc. Select Tools > DB > Reverse DDL… from the toolbar. This opens the Reverse DDL window. 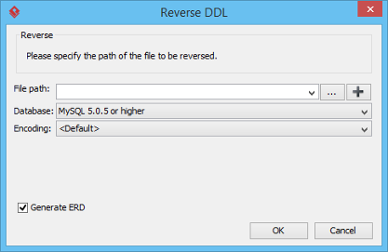 In the Reverse DDL window, enter the file path of the .sql or .ddl file to reverse. Select the kind of database that supports your DDL file. Select the encoding of the .sql or .ddl file. Leave it <Default> if you are uncertain. If you want to form an Entity Relationship Diagram automatically after reversal, keep Generate ERD reversed. If you uncheck it, entity elements will be formed without creating any diagrams. No matter what, you can visualize entities later on if you want to.